Great expectations met with anticlimax as Finance Minister Arun Jaitley came up with a mixed bag for India's insurance sector in the Union Budget of 2016-17. Last year's union budget saw introduction of personal accident insurance plans, enhanced limit for tax deduction in health insurance policies and benefits for pensioners. This made us expectant of even better announcement in the budget for insurance sector. However, the final outcome of budget let us down at large. The budget endowed us with some reasons to smile. Here are the key positive excerpts of the Union Budget 2016-17 pertaining to insurance industry in India. The biggest boon for insurance sector is the introduction of health insurance cover under the National Health Protection Scheme or NHPS. The health cover is designed to cater to BPL families that constitute one-third of India's total population. The health scheme offers a cover of Rs.1 lakh per family consisting of a family-head, spouse and three dependents. An additional coverage of Rs.30,000 is also in store for senior citizens. The health cover is likely to provide assistance to those underprivileged people who are deprived of any health insurance policy in India. The limit of health coverage under Rashtriya Swasthya Bima Yojana for BPL families was Rs 30,000 This limit has increased significantly. This will promote the penetration of health insurance across India Presently, less than 5% of India's total population buy a health insurance plan and the demand is mainly limited to urban areas. Families just have to pay only Rs 30 for enrollment. State and Central governments will be responsible for paying premium to the insurer. Although, the proposed health plan is seemingly beneficial there are some downsides associated with it. As of now, the plan is not comprehensive in terms of extent of reach, features and the amount of premium. Furthermore, if the plan doesn't come up with a reliable claim mechanism and a robust underwriting process it will give rise to fraudulent activity. Previously, Pradhan Mantri Jeevan Jyoti Bima Yojana scheme saw over 30% claims in the very first month of securing the policy. The same could happen with the proposed health scheme. Finance minister Arun Jaitley further announced that pension and insurance sectors will receive foreign investment up to 49%. However, the investment will be conditional upon existing Indian management guidelines. In order to ensure transparency and accountability the foreign investments will be verified by the government-owned companies and regulators. To boost this initiative, it is also proposed in the budget that public sector general insurance firms will be enlisted on stock exchanges. Another good news for insurance sector is the removal of service tax from the Niramaya Health Insurance scheme. The premium amount for this policy on coverage of Rs.1 lakh before the budget was Rs.250 for families with earnings below Rs.15,000 per month and Rs. 500 for families earning more than Rs.15,000 including 14% service tax. This proposal will prove to be beneficial for those who suffer from multiple disabilities, autism, intellectual disabilities and cerebral palsy or have dependents with such conditions. With the omission of 14% service tax the premium will go down to Rs. 185 and Rs. 430 respectively for families earning less than Rs.15,000 and families earning more than Rs. 15000. The government has made a proposal in the union budget 2016-17 to reduce 3.5% service tax to 1.4% of the premium of single premium insurance plan with a view to increase the sale and demand. The draft proposal to lower service tax of the premium of single premium insurance plan is not likely to be effective since very few people buy such plans. In India's insurance sector regular premium policies are the best-seller ones. 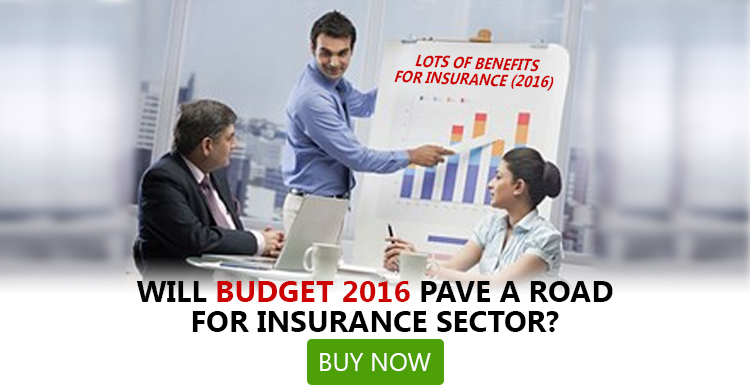 Aside from the above-mentioned announcements, the budget 2016-17 disappointed insurance sector at large. Here are the most disappointing aspects of the budget for India's insurance industry. The arrangement of adequate funds to run public health schemes continues to be an intense struggle as the budgetary allocation for National Health Mission is stagnated. There is a negligible 2% rise as the budget for NHM has increased from Rs.19,135.37 crore in this year to Rs.19,437 crore in the next year. Despite of repeated recommendation from experts to allot at least 2.5 per cent of entire GDP on health, the budget 2016-17 increased total public spending to a mere 1.87%. This rate is well and truly dismal when compared to 8% in UK and 12% in France. It was widely expected that the budget 2016-17 will increase the tax deduction limit from Rs 50000 to Rs 2 lakh under the Income Tax Act section 80C. However, finance minister Arun Jaitley didn't pay heed to any such plea. In spite of an upsetting budget, some constructive steps are proposed in the budget 2016-17 for insurance and healthcare sector of India. Here are some key positive takeaways. 1. Union Budget 2016-17 introduced Prime Minister Fasal Bima Yojana which is an innovative Crop Insurance Scheme by Indian Government. Rs 5,500 crore has been granted to implement the scheme effectively. 2. Finance minister Arun Jaitley proposed to run 3,000 more Jan Aushadhi stores across India to make generic medicines within the reach of the common mass. At present, there are 137 Jan Aushadhi stores in operation in 19 states all over India. 3. The entire grant for health which includes AYUSH in budget has increased from Rs.34,956.6 crore in 2015-16 to Rs.39,532.55 crore in 2016-17.This means there is an almost Rs.5,000 crore or 13% hike in the allocation for health overall. 4. The allotment for super specialty facilities which comes under the Pradhan Mantri Swasthya Suraksha Yojana in budget 2016-17 has increased from Rs.1,215.85 crore to Rs.2,500 crore. Hopefully, this move will give impetus to establishment of new AIIMS and reformation of state hospitals. 5. Finance minister declared that National Dialysis Service Programme will set up dialysis units in all district hospitals for patients. The budget also proposed to exempt dialysis equipment from excise and customs duty. Some positive steps are announced by the finance minister in the union budget of 2016-17. Although, these steps will pave way for minor reform in the vast gamut of public health they fall short to curb the burning issue of providing common mass with access to healthcare facility. Especially, as far as addressing the ordeal of non-communicable diseases are concerned these measures are unfortunately inadequate. According to Registrar General of India NCDs have a high share in India's mortality rate. Only cardiovascular diseases are responsible for 23% of all deaths in India. Overall, the budget 2016-17 fails to meet the expectations of insurance as well as healthcare sector of India.